Located on the Mendocino coast at the only vegan resort in the United States, The Ravens Restaurant at the Stanford Inn by the Sea embodies a mindful, compassionate, and sustainable dining experience in an enchanting and unforgettable setting. Now in Dining at The Ravens, Jeff and Joan Stanford, the Inn and restaurant founders, bring the Ravens culinary experience into your home. 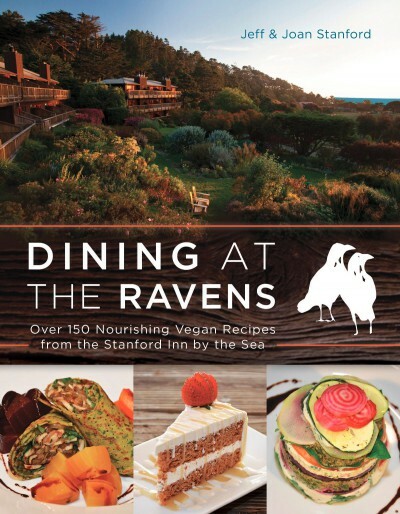 Teeming with beautiful photographs, Dining at The Ravens features more than 150 delicious vegan recipes and shares the charming history of the Inn and restaurant, cooking tips for perfect recipe execution, and even inspiration for creating your own garden. Pull up a seat and find out why vegans and non-vegans alike flock to The Ravens for an extraordinary dining experience. Jeff and Joan Stanford came west to Carmel, California to find careers in education, agreeing to help manage a small inn while looking for work. Jobs were scarce, the United States was in recession, and they found themselves enjoying their guests and rehabilitating the property they managed. Looking to the future, they chose to continue inn-keeping, and by 1980 they were in Mendocino starting a family. 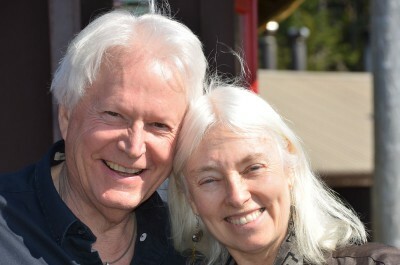 Joan ran the front, while Jeff remodeled the inn and created their certified organic farm on the site of what had been known as the China Gardens during Mendocino’s logging era. The Inn allowed both of them to return to their former interests. Passionate about early education, Joan trained as a Montessori teacher which led her to discover the power of art to transform human experience. She enrolled in psychology at Sonoma State University and received an MA, specializing in Art Therapy. Today she is a registered art therapist, collagist, and educator. Jeff recognized that the “state of realization” that so many sought in the movement of the 1970s and 80s must come from a new relationship with life, beginning in the kitchen, where decisions affect the practitioner and the planet. He became vegetarian as a first step to honor all life, not only the lives of his family, friends, and pets. He and Joan sought to create an inn that sat softly upon the earth. They created one of the first “green” bed and breakfast inns without realizing they were doing so. Understanding that their Inn was a destination, Jeff and Joan wanted to provide the highest quality food to their guests, which Jeff began cooking in the early 1990s. The restaurant followed their philosophy serving a whole food, plant based dishes designed to rival the cuisine found at the highest rated restaurants in the San Francisco Bay Area. They discovered that many cooks can create great food, and they created a co-creative kitchen where all are invited to comment and tweak dishes. The final arbiter is Jeff, but the process is dynamic and assures that each person in the kitchen can express their creativity. Learn more at ravensrestaurant.com and stanfordinn.com. Cold, refreshing, slightly spicy, and sweet—this is a great soup for awakening the palate on a late summer afternoon before a dinner of grilled vegetables and barbecued portobellos, followed by strawberry shortcake. 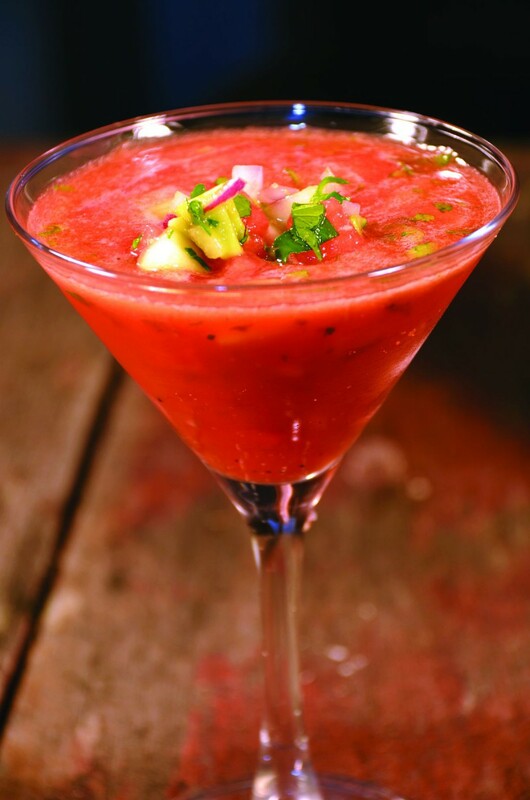 Using a high-speed blender, blend 6 cups of the watermelon until well pureed. Set aside in large container. Add all remaining gazpacho ingredients to blender and puree. Add pureed vegetable mixture to watermelon puree and chill in refrigerator. In small mixing bowl, combine all ingredients and mix well. Serve 1/4 cup scoop atop each bowl of gazpacho. Jeff and Joan are true visionaries with the creation of The Stanford Inn and Ravens Restaurant. Their fine establishment embodies sustainable, compassionate and responsible living. The inspired recipes within these pages showcase how accessible and sumptuous plant-based eating can be. And now you can bring the sublime experience of dining at The Stanford Inn into your own kitchen. From inspired gourmet dishes to wholesome comfort food, there’s something here for everyone—and it’s all amazingly delicious and cruelty-free! Finally, something different in the world of vegan cookbooks! While 30-minute weeknight meals have their place, sometimes you just want to roll up your sleeves and cook the comforting, delicious kind of food you’d get at a bed-and-breakfast. For that, Dining at The Ravens delivers—from homemade breads, to luxurious sauces and mains, to brunches you’ll want to share with friends—it’s all here. And it’s all healthy, whole, and compassionate. This is the kind of cooking I thought I’d never get to do again. The recipes in Dining at The Ravens are a perfect mirror to the experience of staying at Stanford Inn: comforting, familiar, magical, and delightfully surprising. The tantalizing array of tastes showcased in this book are diverse enough to seduce the most seasoned gourmand, yet simple and approachable enough to be enjoyed by new fans of plant-based cuisine. If you can’t make the life-changing trip to visit the inn in Mendocino, this book gives you a beautiful glimpse of the culinary genius and natural beauty there! There is no place like the Stanford Inn. Jeff and Joan have built an amazing business rooted in compassion, sustainability, and wellness, and I absolutely love visiting. This book is an extension of their ideals and vegan lifestyle, and the delicious recipes show that living this way is enjoyable and enriching. When I stayed at the Stanford Inn by the Sea, everything was breathtaking: estuaries, gardens, forests, and fireplaces. But what made it truly remarkable was the food at The Ravens. I hope that one day you too will be able to visit this extraordinary place. In the meantime, the next best thing is bringing The Ravens to your home. The recipes in this book prove that indulgence and nourishment perfectly commingle. Dining At The Ravens is a gorgeous collection of recipes that are full of brilliant colors, layers of deliciousness, and creative ideas making these dishes unique and totally mouthwatering. Perfect for the vegan cook who wants to impress their guests! Dining at The Ravens is very highly recommended for personal, family, and community library Vegan/Vegetarian cookbook collections.